Radio networks are often at least partially based on microwave relay links. They're those little mushroom-like appendices growing out of cell towers and building-mounted base stations. Technically, they're carefully directed dish antennas linking such towers together over a line-of-sight connection. I'm collecting a little map of nearby link stations, trying to find out how they're interconnected and which network they belong to. We can find a rough direction for any link antenna by approximating a tangent for the dish shroud surface from position-stamped video footage taken while circling the tower. Optimally we would have a drone make a full circle around the tower at a constant distance and elevation to map all antennas at once; but if our DJI Phantom has run out of battery, a GPS positioned still camera at ground level will also do. 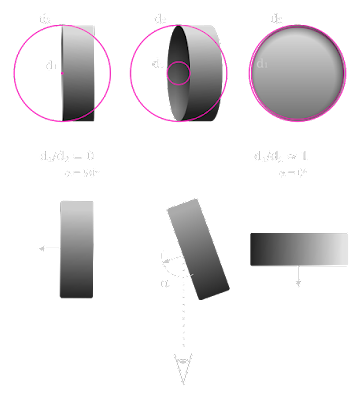 The rest can be done manually, or using Hough transform and centroid calculation from OpenCV. 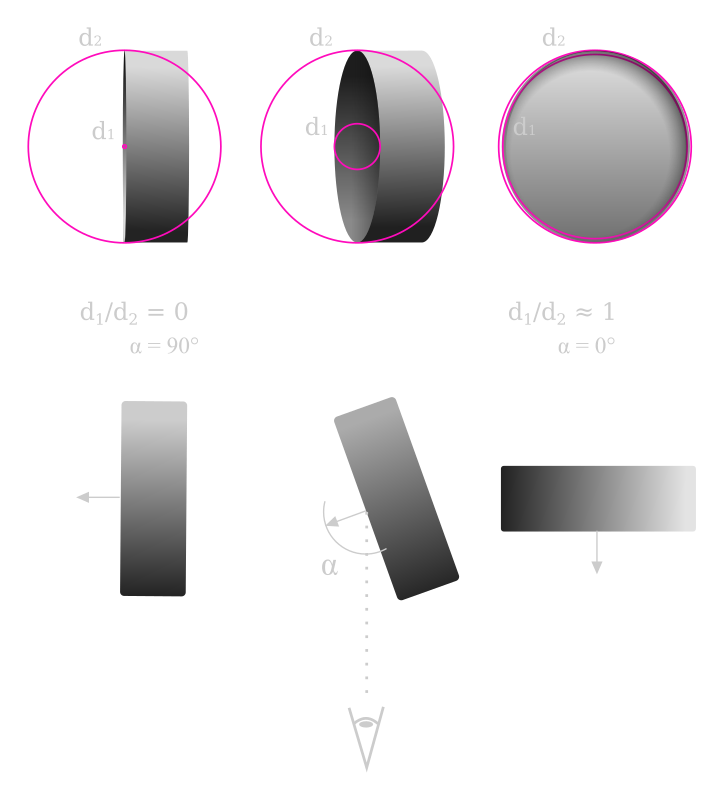 In these pictures, the ratio of the diameters of the concentric circles is a sinusoid function of the angle between the antenna direction and the camera direction. At its maximum, we're looking straight at the beam. (The ratio won't max out at unity in this case, because we're looking at the antenna slightly from below.) We can select the frame with the maximum ratio from high-speed footage, or we can interpolate a smooth sinusoid to get an even better value. This particular antenna is pointing west-northwest with an azimuth of 290°. Because of the line-of-sight requirement, we also know the maximum possible distance to the linked tower, using the formula 7140 × √(4 / 3 × h) where h is the height of the antenna from ground. If the beam happens to hit a previously mapped tower closer than this distance, we can assume they're connected! This antenna is communicating to a tower not further away than 48 km. Judging from the building it's standing on, it belongs to a government trunked radio network. It's funny you make an article about that now, I have just started since a few days to try to generate a map of links between microwave relays in France (here we call them "FH" for "faisceaux hertziens", literally "radio beams"). Our government has released a free online tool named "Cartoradio" where we can see every declared antenna emitting at least with 5 watts, that includes GSM/UMTS/LTE, DVB-T/DVB-S, FM, GSM R, WiMax, private networks (PMR)... but also microwave relays, along with their azimuth, emission frequencies, operator, size, height from the ground... It seems to me that this tool is linked to some european directive, do you have something similar in Finland? My idea would be, from Cartoradio's CSV-exported data, to calculate what microwave relay is linked to another one, and to create a map showing these links, also showing what are the "backbone" pylons concentrating the most of relays, and some funny calculated information like the tilt of the antenna... But creating a good (and efficient) algorithm for that is a rather more complex task it may seem to be, as there are many small inaccuracies and inconsistencies in the database; also, I had to script some downloading tasks, as data can be exported only for a relatively small area at once. Thanks for your formula about the line-of-sight requirement, I didn't think about that. As far as I know, there is no such list in Finland, unfortunately. I'd love to hear about your progress. This is fun to do from Google Maps StreetView. You typically get at least six shots with the antenna in full view, you get GPS coordinates of the photo and the antenna as well. Great idea!